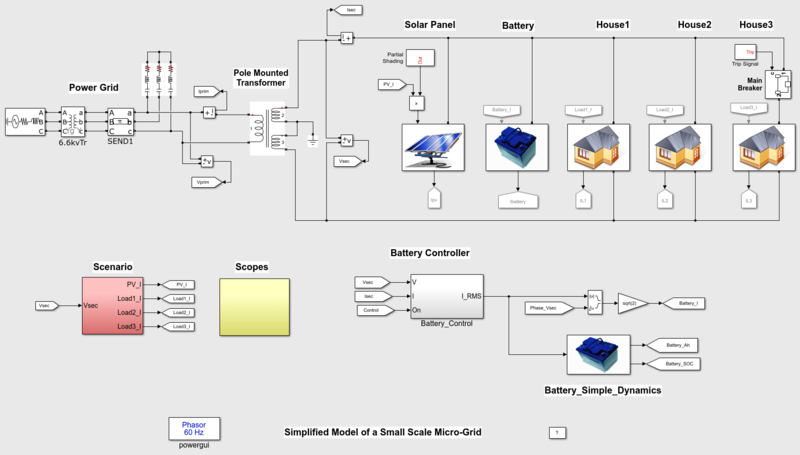 This example shows the behavior of a simplified model of a small-scale micro grid during 24 hours on a typical day. The model uses Phasor solution provided by Specialized Power Systems in order to accelerate simulation speed. 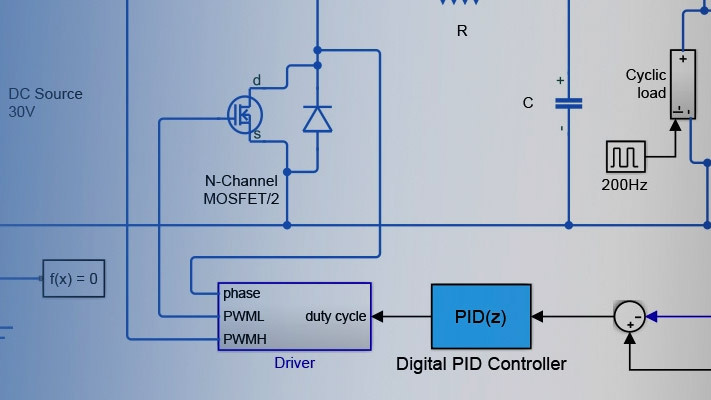 The micro-grid is a single-phase AC network. Energy sources are an electricity network, a solar power generation system and a storage battery. The storage battery is controlled by a battery controller. It absorbs surplus power when there is excess energy in the micro-network, and provides additional power if there is a power shortage in the micro-network. Three ordinary houses consume energy (maximum of 2.5 kW) as electric charges. The micro-array is connected to the power network via a transformer mounted on a post which lowers the voltage of 6.6 kV to 200 V.
The solar power generation and storage battery are DC power sources that are converted to single-phase AC. The control strategy assumes that the microarray does not depend entirely on the power supplied by the power grid, and the power supplied by the solar power generation and storage are sufficient at all times. From 20h to 4h, the solar power generation is 0 W. It reaches the peak amount (5 kW) from 14h to 15h. As a typical load change in ordinary houses, the amount of electric power load reaches peak consumption at 9h (6,500 W), 19h, and 22h (7,500 W). From 0h to 12h and from 18h to 24h, battery control is performed by battery controller. The battery control performs tracking control of the current so that active power which flows into system power from the secondary side of the pole transformer is set to 0. Then, the active power of secondary side of the pole mounted transformer is always around zero. The storage battery supplies the insufficient current when the power of the micro-grid is insufficient and absorbs surplus current from the micro-grid when its power is surpasses the electric load. battery are not performed by the battery controller. When there is a power shortage in the micro- grid, the system power supplies insufficient power. When there is a surplus power in the micro-grid, surplus power is returned to the system power. At 8h, electricity load No. 3 of an ordinary house is set to OFF for 10 sec by the breaker. A spike is observed in the active power on the secondary side of the pole transformer and the electric power of the storage battery.